Very well articulated, all excellent points. In particular I see #4 as key. Currently I’m doing a consultancy for a client who has invested in a suite of new security technology. Their problem space has moved from too little to too much security telemetry. 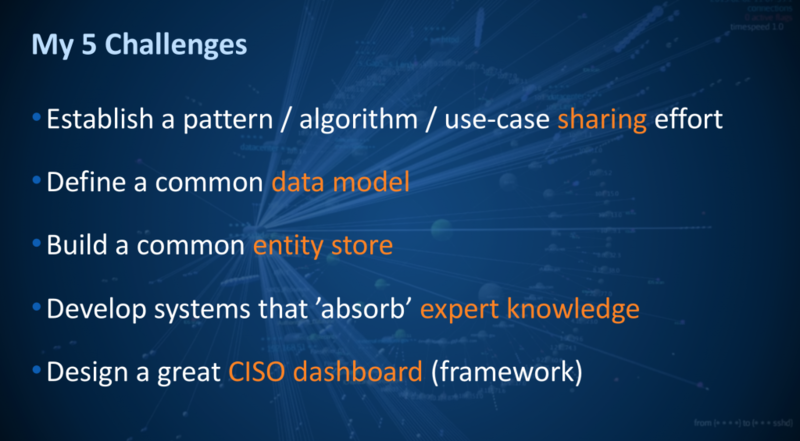 As far as SIEM space goes there is no central knowledge repository (that I can find) that collects the types of reports/alerts/correlations/etc that should be used to drive Sec Ops. So that collection of expert knowledge is so important to moving the domain forward. Very interesting call to action also would be good to mention the yara rules. BTW re #3 and #5 I really recommend having a look at what Cybeats does in IoT space.